Do'h! Join Homer, Marge, Bart and Lisa as they race around Springfield landmarks on another madcap quest. There are strange happenings in Springfield. People are missing, very mysterious crop circles are appearing, and hidden cameras are being exposed. When Homer notices a black van with a satellite dish parked outside the Simpsons house, he decides to investigate further into these odd events. Explore Springfield as your favorite Simpsons characters as you unravel the plot that threatens the town's very existence. GTA In The Simpson’s World!!! This game can be best described as Grand Theft Auto with a Simpsons skin on it, and it is fantastic. It is very fun and very wacky. It retains all the humor from the show, making this game a blast to play. Mmmm, Donuts!!! Glad I was able to find it here for a decent price. 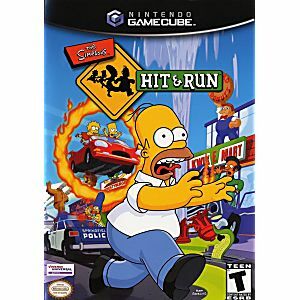 Hit and Run is, for all intents and purposes, a sequel to Road Rage. It features many of the same gameplay mechanics and even some of the same lines of dialogue. But whereas Road Rage focuses solely on the cars, Hit and Run adds a good deal more. The story is simple.Homer is engaged in his favorite pastime, which is of course sitting on the couch watching TV, when he sees an advertisement for a brand new cola called Buzz Cola. Intrigued, He decides he must have some. As it happens, Marge has a job for him that might work to his advantage in that regard. This marks the beginning of a whole sequence of bizarre events, from unmarked black vans all over Springfield to a sudden infestation of strange bee-shaped cameras. It's up to the Simpson family and a few others to try to unravel the sinister plot before it's too late. Gameplay wise the game is divided into levels, each of which is divided into a series of small missions, some of wich can be infuriatingly difficult. Each level stars either one of the Simpsons or one of their allies, most notably Apu. Level one features Homer, who aside from having to replace the family's stock of miniature pie icecream and get some Buzz Cola in the process,must also accomplish such other tasks as "recovering"various items he stole from Ned Flanders before the police catch him. The gameplay is quite a bit more involved than Road Rage. Not only do you drive around the city but you also have to get out of your vehicle and walk or jump to various destinations to talk to various individuals. You can also kick or punch people or objects, though you want to be careful about doing this. Feel free to kick or punch the crap out of any inanimate objects you see. In fact sometimes this can yield handy rewards. Try smashing up or running over a few of the bee cameras and you'll see what I mean. Hitting people is quite another matter though. Their reactions can be quite amusing but if you keep it up the police will come and, if they catch you, take some of your precious coins. This is also true when driving. If you run over too many people you'll have to contend with the cops. Unlike Road Rage your car is not invulnerable and can be destroyed if you hit too much stuff. There are a few things you can do about this. You can either collect a wrench, which will repair any damage to the current vehicle, find a new vehicle which basically means commandeer any car or truck you find, or enter a phone booth. This is also where you can unlock new vehicles, though you need plenty of coins to do this. Audio wise the game is excellent. Each character has his or own musical style. Lisa travels around Springfield to the accompaniment of smooth Jazz. Bart favors a punkish soundtrack. Apu of course favors a far east flavor, and Homer of course has his classic getaway music. The dialogue is also perfect, even those lines recycled from Road Rage fitting well into the mix. All in all I find this to be a game well worth the money I paid for it back in 2003. It's definitely provided many hours of fun since then. this game was my childhood, I played it a lot but I lost the copy and well I found another here, and the game was new, there wasnt any scratch on the disc and the case was new. i recommend buying from here. Fantastic game the kids love it !! As always, fast shipping and great price! Hit and Run tries to be a GTA for kids - and, while the concept is interesting, the execution is quite flawed. It lacks the breadth, the scope, the level of detail of the original. You can see the show's many famous locations, and actually enter very few. There is little to do on foot: pretty much every mission is "drive from A to B under X seconds", and it gets old fast, especially because the time limits can get very frustrating. The graphics are also flawed, with some annoying screen tearing, and the camera system is quite broken. 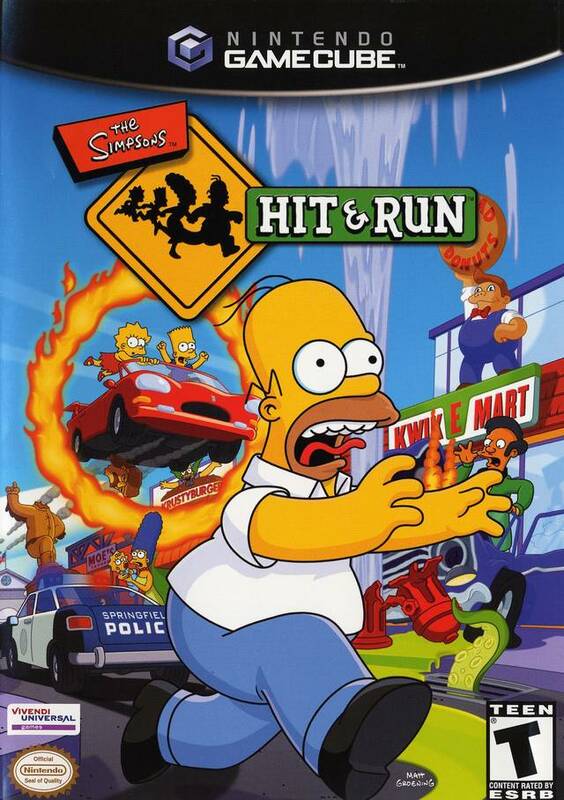 Ultimately, while it is one of the better Simpsons games, it is still mediocre.